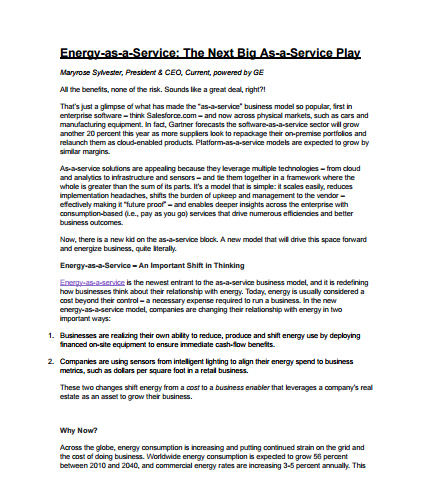 Energy-as-a-service is the newest entrant to the as-a-service business model, and it is redefining how businesses think about their relationship with energy. Energy-as-a-service delivers value at scale. It not only curbs one of business’ biggest operational costs – energy - but uses energy infrastructure to drive value, even as needs change over time. How leveraging multiple technologies makes as-a-service solutions appealing? What are the ways in which the companies are changing their relationship with energy in the new energy-as-a-service model? How the growth of as-a-service models is setting the stage for companies to improve how they think about energy use? This whitepaper outlines the challenges of Intel implementation. Designing an Intel-based computer has become an increasingly complicated process, requiring the developer to overcome the key issues lies in Intel's implementation process: How to implement a series of complex power conversions and sequencing? How to reduce physical footprint for small form factor applications? How to search through hundreds of pages of Intel-supplied documentation for answers to questions? If you want a headache-free way to leverage the power of Intel’s SoC, while eliminating the need for complex power circuit design and reducing time-to-market download this free whitepaper which helps you in taking the complexity out of Intel design. Software as a Service (SaaS) is one of the three components of cloud computing alongside Infrastructure as a Service (IaaS) and Platform as a Service (PaaS). It is basically the process of equipping organizations with software applications over the internet- as a service. In this software distribution model, the provider hosts the application and makes them available over the Internet freeing one from complex hardware infrastructure installations.